Don't let competitors or angry clients/customers sabotage your online reputation with negativity. You can properly position your business in a better light. Giant Concepts can help your business by employing an online reputation management strategy that positions the results you want shown in the search engines. Are you an individual with an angry ex? Are you a professional that has had an angry client post negative things on the Internet? We can help! Let’s pretend that you’ve just left a business meeting with a potential client. You pitched your product or service and made a positive impression with what you had to offer. You are about to close this sizable deal with them and you are very confident that, with a follow-up call, you’ll have them signing the paperwork. Now pretend that you are that same client. You’ve received this excellent proposal, and you’re almost ready to sign, but you decide to run a quick search on the company just to do your homework. Lo and behold, you pull them up on Google, and the third link down brings you to a forum where customers are discussing how displeased they were with their experiences in dealing with this company that you were right about to hire. 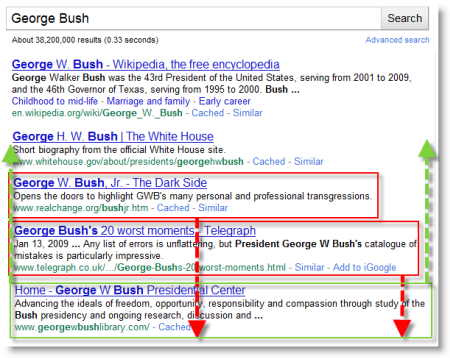 Would you still want to sign with a company after seeing this type of negative search result? Highly doubtful. As blogs and forums have risen in popularity with the advent of Web 2.0, search engines are indexing new information at lightning speeds. With consumers increasingly researching products and services online for reviews from trusted sites and bloggers before committing to buy, the opinions posted on blogs and message boards have the power to make or break your brand. When your goal is to convert your target market into loyal customers, having a positive online reputation is key. ONLINE REPUTATION MANAGEMENT IS MANDATORY IN TODAY’S ECONOMY. In this example, the reputation management goal was to not have the negative websites appear and push more positive sites higher. Giant Concepts monitors online conversations and search results in order to track each time your brand or your name is mentioned online. Then, using a variety of our tried and true SEO techniques, we will optimize your search positioning in order to boost your search engine rankings while simultaneously pushing negative results off the search engine results pages. WHY CHOOSE GIANT CONCEPTS FOR REPUTATION MANAGEMENT? Giant Concepts has developed trusted, long-lasting relationships with our clients and business partners, maintaining and managing their online reputations while protecting their confidentiality and interests. Contact us to learn more about how we can help you optimize and manage your online reputation.